Thank you for your interest in Greenspring Endodontics, a dental practice specializing exclusively in all phases of non-surgical and surgical endodontic care. We provide the highest standard of professional care in a friendly, comfortable atmosphere to make your visit as pleasant as possible. We would like to take this opportunity to welcome you to our practice and look forward to providing you with the exceptional endodontic care you deserve. 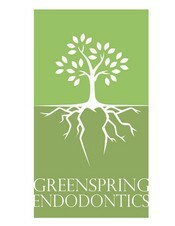 Greenspring Endodontics is equipped with the most up-to-date, high-tech endodontic equipment currently available. Our office is conveniently located within the scenic Quarry Lake community, directly off the I-695 exit at Greenspring Avenue in Baltimore County. Our goal is to provide you with the highest quality endodontic care in a comfortable and relaxed atmosphere. By utilizing the most advanced technology, Dr. Reff can diagnose and treat your tooth with highest accuracy, all while keeping radiation exposure to a minimum. We hope that the information contained in this website serves to answer many of your questions about endodontic treatment. If you have any additional questions or require further information, please contact us by phone at (410) 653-0900 or e-mail at office@greenspringendo.com. On November 13, 2014, Dr. Reff was welcomed as a Diplomate of the American Board of Endodontics. This honor, which is obtained by a small percentage of practicing endodontists, is considered to be the pinnacle achievement of the profession and reflects Dr. Reff's commitment to his field and to his patients. "Methodology: We surveyed nearly 3,000 dentists in Baltimore and the five surrounding counties, then selected those with the highest number of peer recommendations in each of several regions." Thank you, Dr. Reff for being so professional and so helpful to me during the root canal. You were very compassionate. It was especially comforting because you talked to me thoughtout the procedure, telling me what to expect, etc. Thank you so much! I write to acknowledge that my experience of having my first root canal was a positive one. Your kind gentle manner put me immediately at ease and the entire procedure was painless. I also want to acknowledge your assistant, Jenny, for her kindness. You are an awesome team! Many thanks. Thank you, Dr.Reff, for your professionalism, convenience, & prompt attention to my dental emergency. The kind & courteous staff was an added bonus! I appreciate your help! 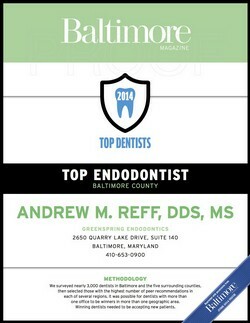 Dr. Reff is my endodontist of choice in the Towson / Baltimore area. He has a beautiful modern office at The Quarry. He has excelled clinically and communicating with our patients and our staff. Five stars all around. Thanks for treating our patients like royalty Dr. Reff!